The pivot point focuses on the closing price relative to the bar with the highest High (or lowest Low). 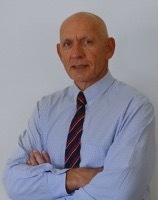 The close is below the Low of the day with the highest High. The close is above the High of the day with the lowest Low. 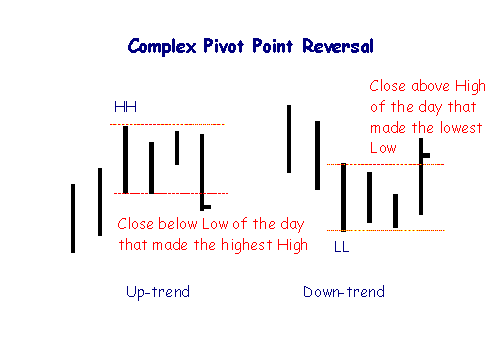 Complex pivot points sometimes occur, where it may take several days to form a pivot. The signals are most reliable if they occur after a strong trend. If the trend is weak, so is the signal. 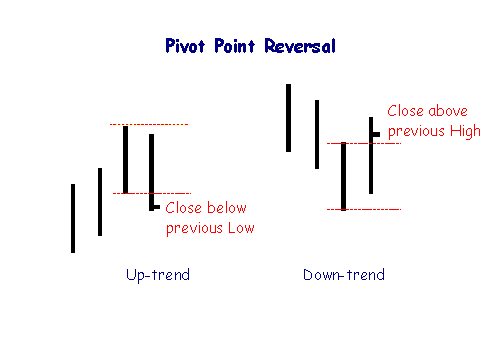 Reversal Days Every trend change is signaled by a reversal day. The secret is to identify their potency.